The DrayTek Vigor2862 LTE is a VDSL2/ADSL2+ Router with built-in 3G/4G/LTE modem. In addition to the DSL connection, cellular connectivity can be added by simply inserting a SIM card. Up to 4 Internet access connections can be set up on Vigor2862 LTE to provide high network availability. As well as being a reliable Internet gateway, it also provides comprehensive firewall and content security management (CSM) to protect the local network. It can also be a VPN gateway for up to 32 simultaneous VPN connections, to allow secure connections over the Internet. The Vigor2862 LTE Series offers comprehensive DSL connectivity which makes it compatible with various versions of xDSL, including ADSL, ADSL2, ADSL2+, VDSL, and VDSL2. Vigor2862 LTE Series routers also automatically detect your line type and fallback is supported. Vigor2862 LTE routers are integrated with an LTE modem that accepts the standard size SIM cards. With just a SIM card (and a data plan), you can add a wireless Internet connectivity to share the traffic load or backup the primary link. The LTE WAN supports download speed up to 150 Mbps, upload speed up to 50 Mbps, and it works with cellular networks including 4G and 3G, and can automatically fall back to 3G when 4G is not available. As well as the DSL interface, there is also a Gigabit Ethernet WAN port that can be used for UFB connections. 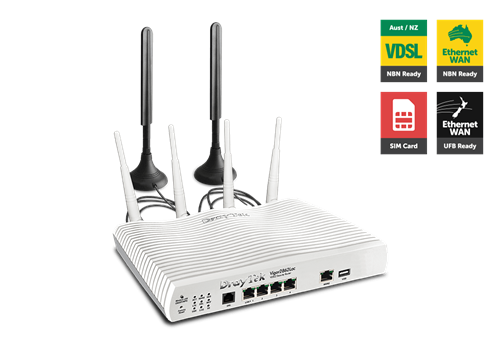 This variant, the Vigor 2862LAC, has dual-band WLAN built-in and is compliant with the latest Wi-Fi standard, 802.11ac Wave 2, which delivers data rates up to 1733Mbps + 300Mbps.